School's Kazmaier Stadium, and although the weather had eventually forced them indoors, it didn't dampen any spirits that night. The high school band members played for the ticket holders during dinner, and once the festivities moved inside the gym, the Glassmen entered the floor to a rousing ovation. 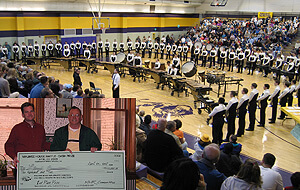 Glassmen members perform for the raffle ticket holders; Brian Hickman presents one of the winners with his check. December outside, it was mid-July inside G-West, as the sound of the corps heated up rehearsal rooms and the flair of the color guard returned to the gym. Even with the late-season snowstorm that swept over the area during the couple days of camp, the corps was able to forge ahead with some drill and music for the summer. The members will return for one more rehearsal camp in May before they move in for spring training and the Valentine Theatre performance. Then it's off on the 2005 summer tour -- see you on the road!